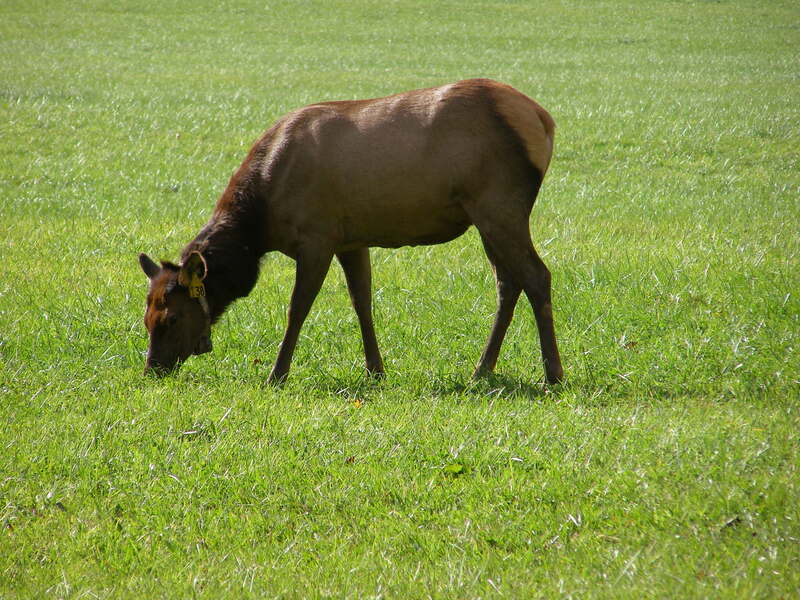 Christine told us about the time she had to chase the people away from the herd of wild Elk at Oconaluftee Visitor’s Center. Mind you, these things average at around eight hundred pounds of muscle and hooves. I took, very seriously, the advice of the local man that we met on the trail on the way back from Cherokee. There were Elk in the river and he said we should approach them with care. As we got nearer, there was a large group of people crowded along the banks of the river, taking photos. One man was at the very edge, feet from the critters with his young child. Christine said that on that previous occasion a woman had refused to move away because she noticed that some of the animals were collared and therefore all the Rangers had to do was zap the Elk if they got too near as if there were monitors directed on every meadow in this huge park. We had the opportunity to sneak into dispatch a few days ago and there was an alert for a “Bear Jam”. This occurs when otherwise “intelligent” people and their children jump out of their cars in the middle of the highway and block traffic on winding, blind curves while they run around with their cameras, phones and pads chasing bears to get a picture. Technology; gotta love it. Refer to the previous post. Bears are NOT cute. As we were driving back from Bryson City yesterday, we got caught behind a huge semi on North 441. Fortunately, the truck stopped at a pull out and we were able to get past. There are two signs at the very beginning of this route. One reads, “NO COMMERCIAL VEHICLES”, and the other reads, “CAUTION: LONG, STEEP, WINDING MOUNTAIN ROAD, NEXT 35 MILES”. We were wondering how he would get through the three tunnels and figured that he might be able to turn around at Clingman’s Dome Road or Newfound Gap Parking Lot if it were devoid of cars (not likely) when the Ranger sped past us in the other direction apparently with the intention of zapping the driver into awareness. Incredibly, there was one rule breaker that we saw yesterday who warmed my heart. 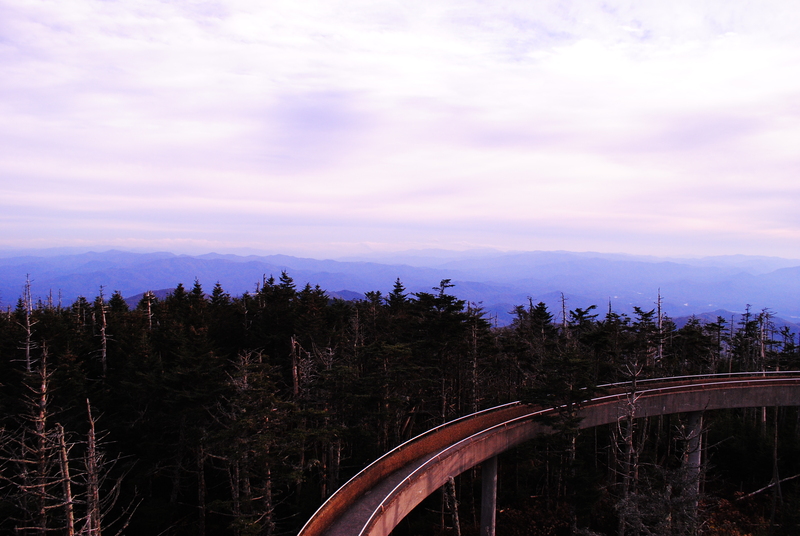 We climbed Clingman’s Dome Trail to the observation tower which is a half a mile long and rises three hundred feet in the interim. This is a very steep incline and most people rested regularly along the way. And, there he was, a man about our age pushing his mother up the hill and up the ramp to the observation deck in a wheel chair. When we got to talking, I reminded them that the hike down might be equally as perilous and the lovely lady winked and said, “Today, I’ve been to the top of the World. It would be a good day to let go”. Worf, the Klingon, said (of coming battles), “Today is a good day to die.” It would be nice to be able to choose.